Over the past few days, several one-person pickets took place in Crimea in support of the Crimean Tatars, arrested and sentenced in “Hizb ut-Tahrir cases”. April 8, Zarema Mamutova, the mother of Enver Mamutov, came out with a picket in the Crimea. Her son was sentenced to 17 years in prison in the Hizb ut-Tahrir case by a Russian court (“the first Bakhchysarai group”). Alie Mamutova, wife of Enver, wrote about the picket on Facebook. The mother of the Kremlin prisoner came out with a poster “My son is not a terrorist, why 17 years?”. However, the security forces soon took the women to the police station. Aliya Mamutova managed to record the moment of detention, as well as how the “police” were taking them to the regional department. Опубліковано Алие Мамутовою Понеділок, 8 квітня 2019 р. 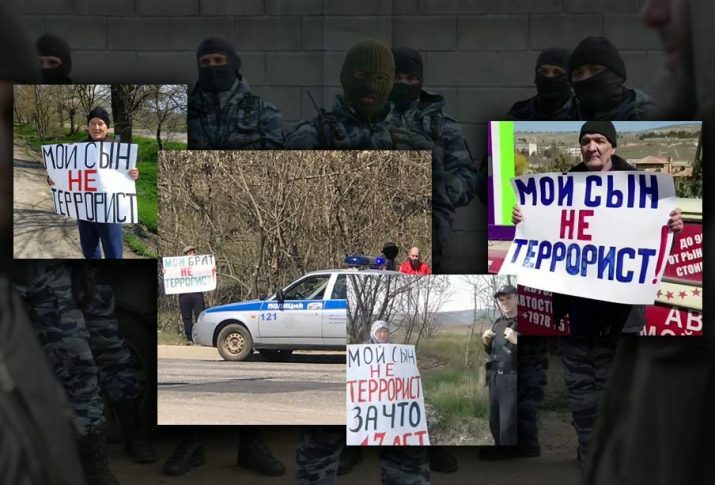 The same day, a one-person picket with a poster saying: “My son is not a terrorist” was held in the Oktyabrskoye settlement of the Krasnohvardiysky district of Crimea. Reshat Emiruseinov, the father of Rustem Emiruseinov, whom Russian security forces detained in Oktyabrskoye on February 14, drew attention to the fate of the unlawfully arrested. "Мой сын не террорист" Решат агъа Октябрьское. Опубліковано Abdurrafi Uzeirov Понеділок, 8 квітня 2019 р. My son has nothing to do with terrorism, as well as other prisoners – the Crimean Tatars in the detention centers or in prisons. He never hurt anyone, did not break the laws. I brought up the worthy son and the person, – Reshat Emiruseinov said. "Мой сын не террорист" !Одиночный пикет.Решат агъа. Октябрьское. Single protests also took place on April 6 and 7. A Crimean Tatar named Karim decided to support an elderly woman, mother of Ruslan Suleymanov, who came out with a single picket on April 6. Her son was detained on March 27 during mass searches in the Crimea. Police officers arrived at the picket site, after which Karim, giving explanations about the reason for his peaceful action, left. Опубліковано Abu Hamza Неділя, 7 квітня 2019 р. On April 6, in solidarity with Suleimanov’s mother, father of Ayder Saledinov went to a picket. His son was arrested in October 2016 in the so-called “Hizb ut-Tahrir case” (Simferopol group). The Crimean Tatar was holding a poster “My son is not a terrorist” and said that Ayder has been kept in the detention center for more than two years. Наши старики достойны уважения…Но достойны ли мы наших стариков? Опубліковано Abu Hamza Субота, 6 квітня 2019 р. On April 2, the international human rights organization Human Rights Watchcalled for an end to repressions against the Crimean Tatars and the release of Muslims detained during mass searches on March 27 and 28. Russian repressions against representatives of the Crimean Tatar people and pro-Ukrainian public figures were also mentioned in the reportof Amnesty International, which was presented at the UN Secretariat for Education, Science and Culture (UNESCO).